Ascending Butterfly: ProFlowers Organic Extravaganza Fruit Basket Giveaway! ProFlowers Organic Extravaganza Fruit Basket Giveaway! This giveaway is now CLOSED. Thanks so much to our giveaway sponsor ProFlowers! The winner has been notified and upon confirmation, follower name will be posted both here and on our homepage. Remember: There are great giveaways active on the upper right hand side of the page! Watch for the next bag in the ‘Spring Into Bags’ series to launch SOON. And for a special 'Back to School' themed Giveaway too! There were no duds here, just tons of yummy Ghirardelli chocolates in different varieties (and it included a good assortment of dark chocolate too! ), and hot chocolate (I don't drink Coffee but I love hot chocolate!) and a red mug (how did they know red is my favorite color?). I was beyond satisfied with this basket and it gets my butterfly seal of approval. Thankfully you can order it online, because if you had it in front of you, you might have a very hard time parting with it! Now for the good and bad news, I selected a highly popular basket that is currently out of stock in the original configuration I received. That's the bad news. But the good news is that our friends at ProFlowers have a different and thankfully very much in stock basket for you to try! 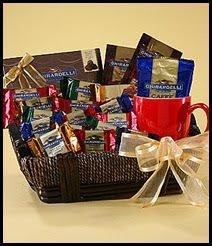 While I didn't get to review the actual basket you will win, I can't see anything not to love! I hope the winner invites me over when this arrives! Ƹ̵̡Ӝ̵̨̄Ʒ - WIN IT! - Thanks to our friends at ProFlowers (who are not just 'flowers' but gifts, baskets, plants and more!) 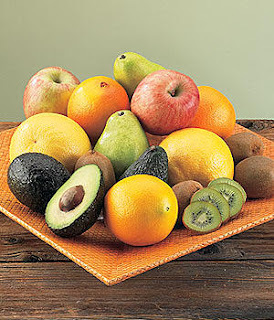 the lucky winner of this giveaway gets an Organic Extravaganza Fruit Basket (a $45 value). Don't you just ♥ ProFlowers? I know I do! How to Win: (1) You must be a PUBLIC follower of Ascending Butterfly to be eligible for this and all giveaways. Indicate in your entry that you follow (if your 'comment name/user id' differs from your profile id, please let me know what name you follow under) and (2) Mandatory Entry (this must be done for all others to count): Visit ProFlowers and post the URL of any OTHER basket or gift (it could be flowers or a plant link too!) aside from the review basket and aside from the giveaway basket! (3) You must also leave your email address somewhere in your comment. (You can format it this way for security, example: ascendingbutterfly AT mail host DOT com). (If your email is clearly visible in your profile, you can just say so, that's OK!) Please follow the easy 1, 2, 3 steps to winning (or in this case, the A,B,C’s of winning!) This giveaway is open to USA residents who are 18 years of age or older. For my Tweetie Lovers, ProFlowers has some additional Twitter Extra Credit for you! Tweet either of the two messages below or both about the ProFlowers Calendar or the Coloring Pages and receive 2 extra credits for each one, post 2 comments for each tweet or 4 comments with the tweet URL's if you tweet both. You can also tweet these two times per day max! 2. I would love this plant. 1. I'm a public follower via Friend Connect (Andrea McCann). I like Ascending Butterfly on FB (Andie McCann)! I've subscribed to AB by email (and verified). I like the Mousse Tort Happy Birthday Cake. http://products.proflowers.com/giftbaskets/Sweet-Mix-Fruit-Gift-Basket-40438?viewpos=12&trackingpgroup=gft&Ref=HomeNoRef&PageSplit= would be my choice. I do follow you on twitter dlsblogs. barb g. (email profile & above). I liked ProFlowers on facebook and left a message on their wall for 3 bonus entries,yah! barb g. (email above,profile). #2 bonus entry for the wall/facebook of sponsor. barb g. (above & profile). #3 entry for the facebook wall post for sponsor. barb g.
I follow your blog on facebook too. barb g.
Following proflowers on twitter now. dlsblogs on there. barb g.
I do follow you on networked blogs. barb g.
I follow Proflowers on twitter as Elkaye. I follow on network blogs as Seafoam. I liked Proflowers on facebook as Sea Foam and posted a comment on their post about the "Flower Coloring Pages For Kids"
I publicly follow Ascending Butterfly on google friend. I follow you on GFC(5webs) and the Red Velvet Cupcakes are calling my name. I picked this basket cause we love all kinds of nuts, they're so delicious! I follow you on twitter. I'm @fureez. I'm a follower and I like this Basket: http://products.proflowers.com/giftbaskets/Love-and-Cuddles-2563?viewpos=21&trackingpgroup=gft&Ref=HomeNoRef&PageSplit= What's better than a teddy bear, flowers and some yummy snacks? I checked out the calendar. Beautiful flowers. I checked out the coloring pages. I like the Big Sunflower. Follow your blog via GFC - my email address is visible in my profile and I would love Mrs Fields Cookie Delectable Delights basket. I would love thisfor my grandma who jsut had spinal surgery! I follow under the name Lynn Nguyen. Checked out the flower calendar! I love their Kaleidoscope flower arrangement, http://products.proflowers.com/flowers/Kaleidoscope-30007018?viewpos=8&trackingpgroup=bsl&Ref=HomeNoRef&PageSplit=!